French authorities are working to contain a fuel spill off the Atlantic Coast after an Italian container ship sank following a fire. French and British rescue teams saved all 27 people aboard the Grande America after it sank on Tuesday (local time), according to a French government statement. 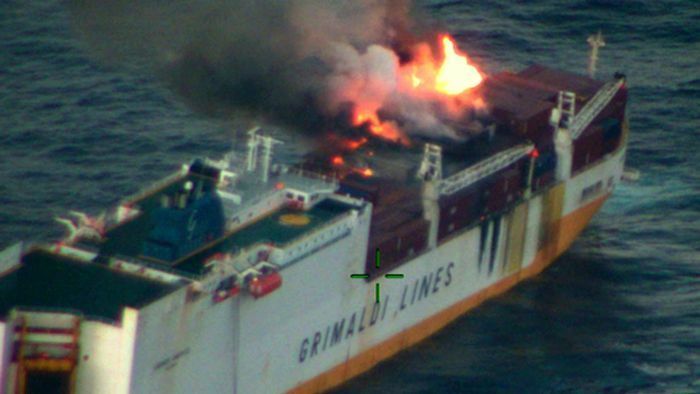 Images released by the French navy showed flames and plumes of black smoke spewing from the ship as it listed sharply. The regional maritime authority said the ship had since leaked fuel over an area about 10 kilometres long and one kilometre wide. The ship was carrying about 2,200 tons of fuel before the accident, the French government minister in charge of the environment, Francois de Rugy, told BFM television. A French clean-up ship was expected in the area on Thursday (local time). France has also reached out to the European Maritime Security Agency for help using satellites to locate leaks. The ship sank about 330km west of the French city of La Rochelle, while en route from Hamburg to Casablanca. The regional prosecutor has opened an investigation, and France has issued a formal warning to the ship’s operator to assess the damage and help prevent more leaking, Mr de Rugy said.